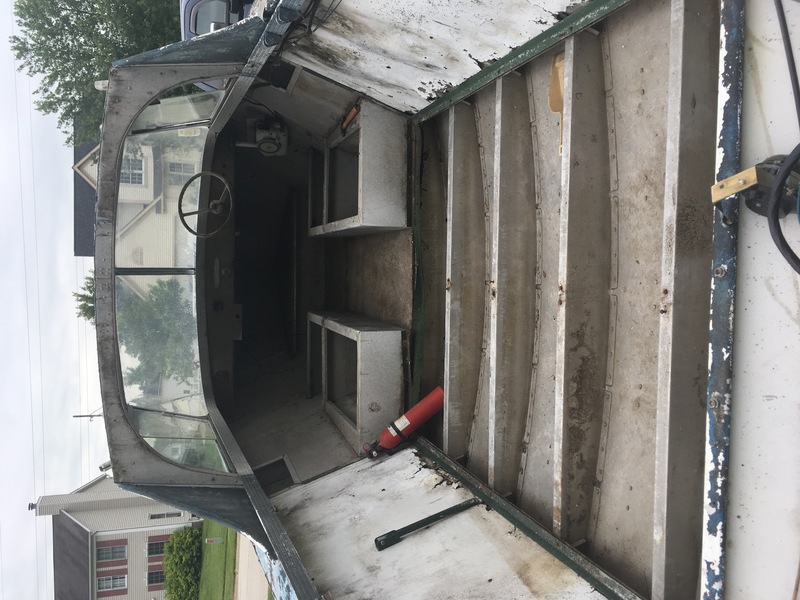 My name is Michael Miller, I have a handful of Lone Star boats and have posted on some other forums and my website before but figured I would share my restoration of my 1960 Lone Star on this site- to try help/inspire some others that may have this boat. I bought this boat in the winter of 2008 from the Daughter of its Original Owner in Ohio for $500. I was in Iraq at the time and she gladly held the boat for me. I picked it up in the spring of 2009 and began work on it to just get it running and on the water. It had its original paint job, and 75hp 1960 Evinrude. After a cleaning and a tune up, I hit the water with the boat and enjoyed the boat in her current condition that summer. The summer of 2010, I decided the boat could use a face lift and I painted the boat. I masked off the original paint job and used a brush and a roller and some enamel paint from Sherwin Williams that I had matched the best I could. The paint job came out great. The boats old wood floor was also in need of attention and I pulled and replaced it as well as the masonite side walls in the aft cabin. 2011 I was preparing to head to Afghanistan and the boat was in need of a cover, I had plans to do more but I lacked to time to do much more restoring and decided to just use the boat as much as I could and enjoy it. Still I had a nice cover made to protect the boats new floor. The summer of 2016, kept me off the water a lot. Work and travel just made it hard and the boat did not get much attention. I did splurge and purchase a 2004 Mercury 50HP Outboard. I decided as much as I wanted to keep a period correct motor on the boat, It was time to enjoy it more and upgrade to some newer turn-key technology that would be more reliable for me. The motor sat on an engine stand for a long time in my garage that winter with me day dreaming of finally getting the rest of the projects done on the boat. The summer of 2017 brought a lot of progress for the boat. 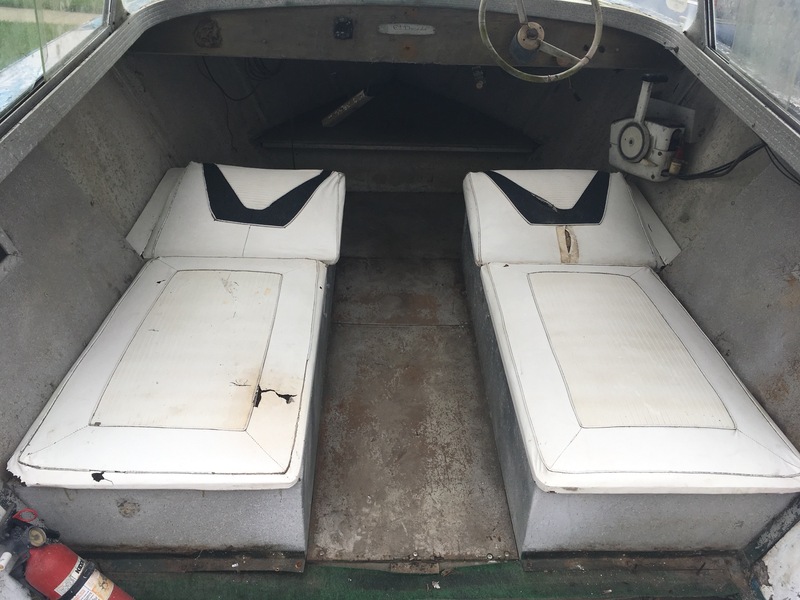 I managed to get the old seats out of the boat and off to the upholstery shop to be redone. The old horse hair cushions were due for some attention and I wanted to start finishing the interior of the boat. The new seats turned out great. 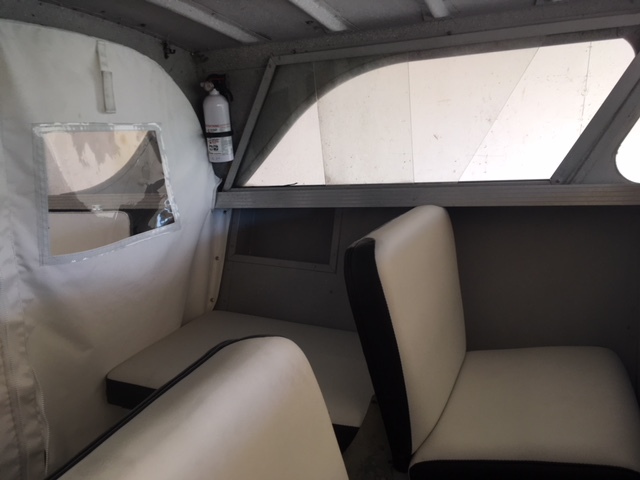 The dash, floor and masonite walls in the boat I had just brushed painted gray years ago and I decided I want them to be like the original splatter paint. I chose to use Zolatone Silver Gray and couldn't have been happier with the results, it sprayed on easy with my harbor freight spray gun. The boat had a table as an option in the aft cabin and I removed it and purchased a sheet a melamine from lowes, traced the old table and used my jigsaw and circular saw to cut out a new one. I trimmed it out with some aluminum counter trim I picked up at the local ACE Hardware. The new motor mounted perfectly in the old holes in the transom, Its nice that the motors mounting holes are all standard. 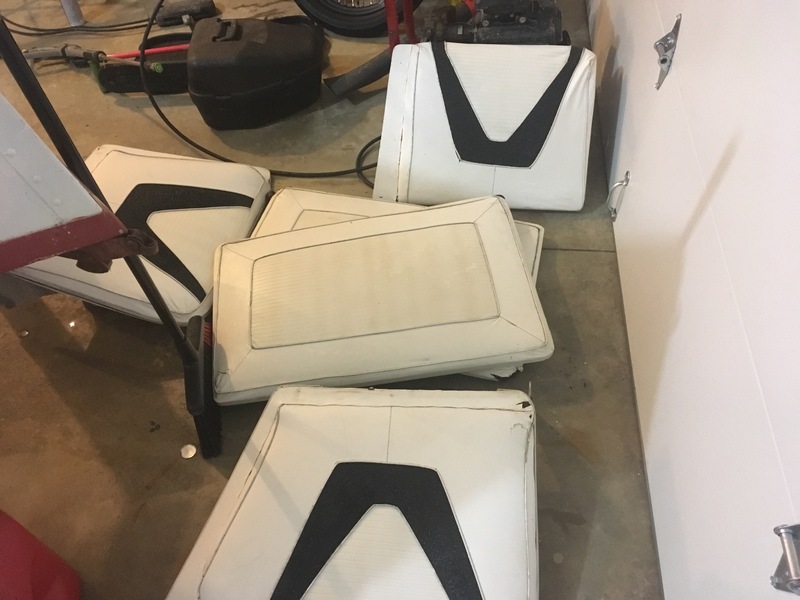 The last project I decided to jump on was the rear transom seat. This was not a stock feature, or even an option. The previous owner must had made this seat and I had removed it years ago but had saved it. After some thought, I decided that the extra seat may actually be kind of nice. So I decided to make a new one, just the like the old. Here is a photo of the original one someone had made. Here is the new one I made. 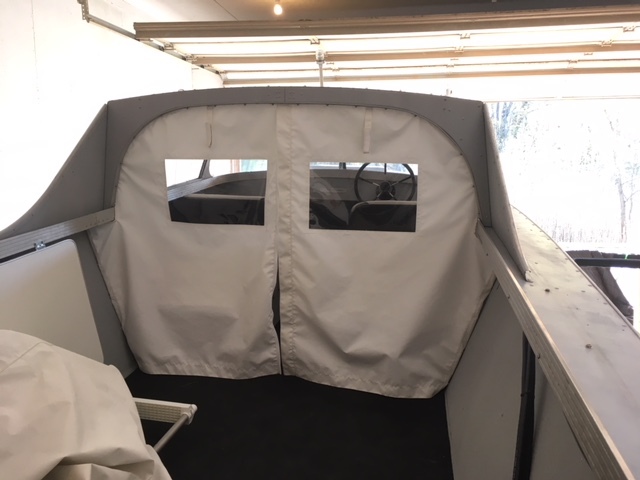 Once I got everything in the boat I was really pleased with how the paint, and new upholstery, rear transom seat and table really made the boat look fresh and new. The rear cabin still had room for a folding chair, and I found a sweet retro style lawn chair in black from LawnChairUSA. The new controls for the outboard made me engineer a new wood bracket on the side console to mount them lower. A little delay to engineer that but the I was really happy with how it looked in the end. The new dash with the tach and new steering wheel looked clean as well. Looks and runs good! Great job. Had a lot of fun on the water with the boat last summer. The 50hp motor has plenty of power for what I like to do on the water and the boat planes out quick with 4 people and even faster with less. 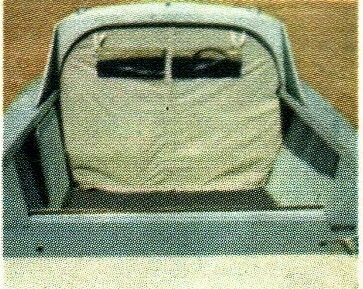 I plan to have a bulkhead door made the boat, this was a factory option as seen from this photo in the catalog in 1960. 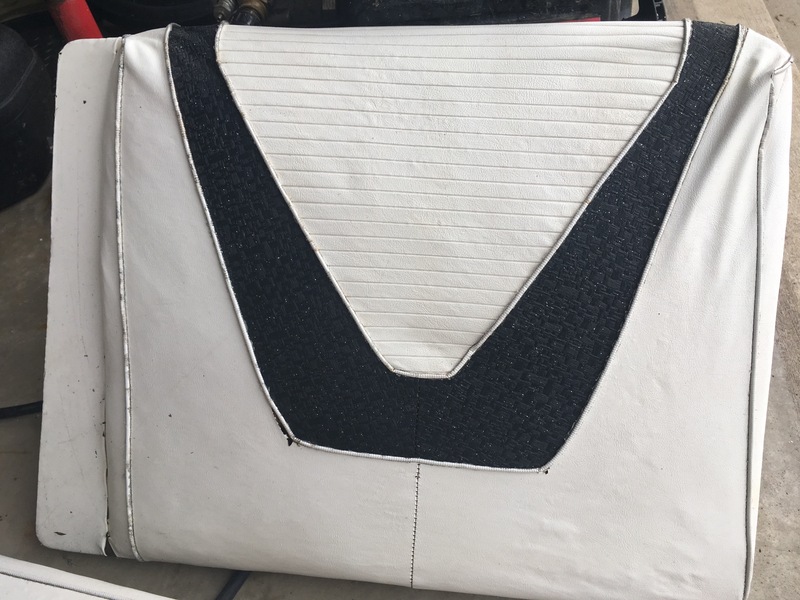 I have an upholstery shop working on making that now, with the windows and zipper closure. The boat also has a working toilet under the one seat, it pulls in water and then flushes into the water. Per all the regulations in Ohio, and I am sure elsewhere- I am supposed to remove the toilet and plug the drain accordingly. I just don't care to remove it. Not to say I am going to use it regularly or at all. But its not broke and I am not going to mess with it. 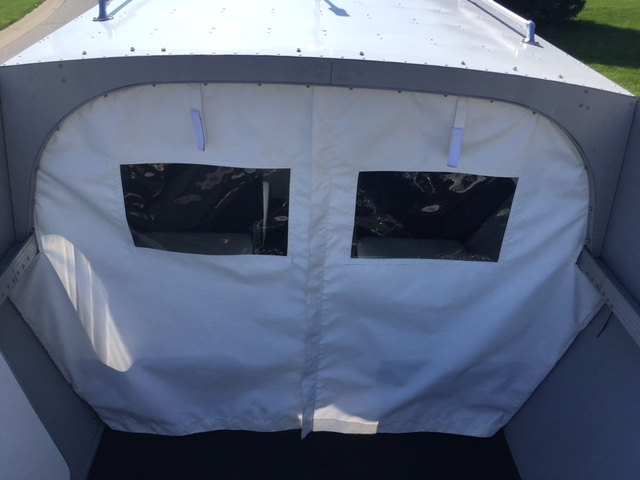 The bulkhead door may make some overnight camping option or offer some protection if the rain moves in and I am stuck on the water or mooring/docked somewhere. Well, the canvas shop came through super quick on the bulkhead door and they made it just like the stock catalog photo I showed them. The window was made larger but I appreciate the extra size. mgm wrote: Well, the canvas shop came through super quick on the bulkhead door and they made it just like the stock catalog photo I showed them. The window was made larger but I appreciate the extra size. Well.....I didn't need it. It all started with a simple craigslist post in the local area of good old Ohio. The next thing you know I ended up searching the whole damn eastern seaboard. Then I saw it, another 1960 Lone Star El Dorado. 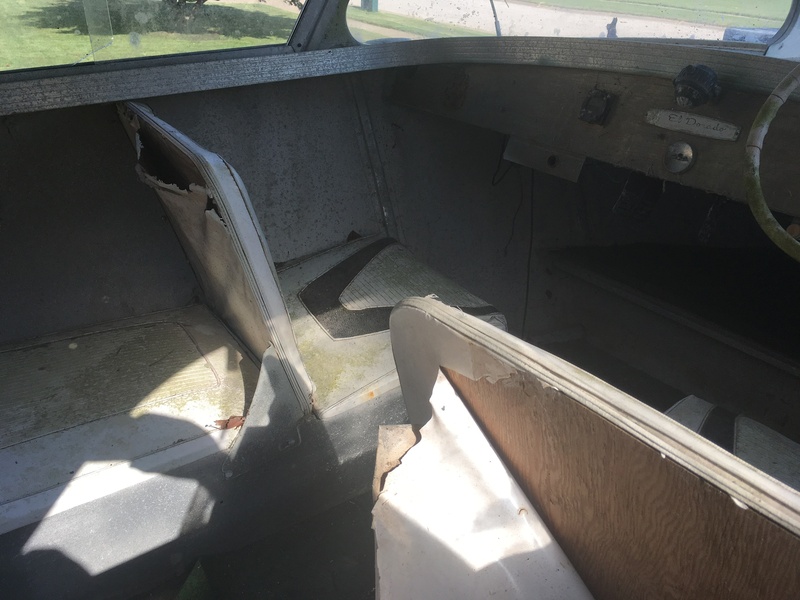 Original seats, all the glass and windshield present, on what looked to be a vintage trailer. Boat was in Florida, near Lake George. 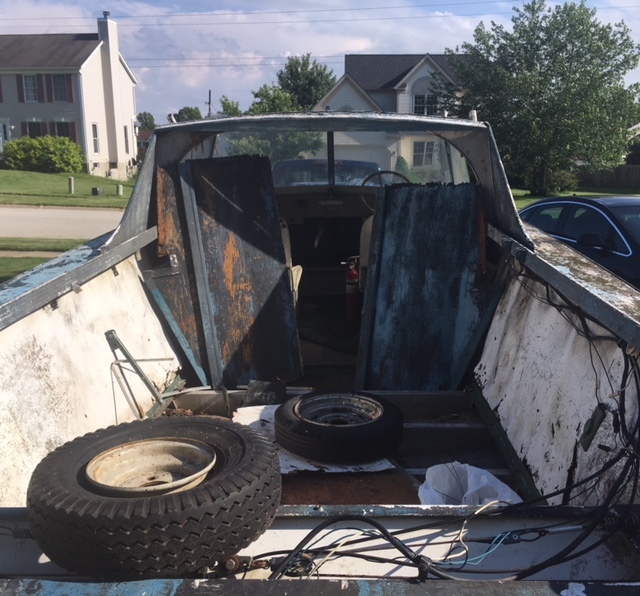 I live in Ohio.....After a phone call to the boat owner and a little bartering- I bought it. I guess I figured what the hell. I have a list of other Lone Star's that need attention and restored but I just have little control. Made some calls and a good friend of mine made the trip. 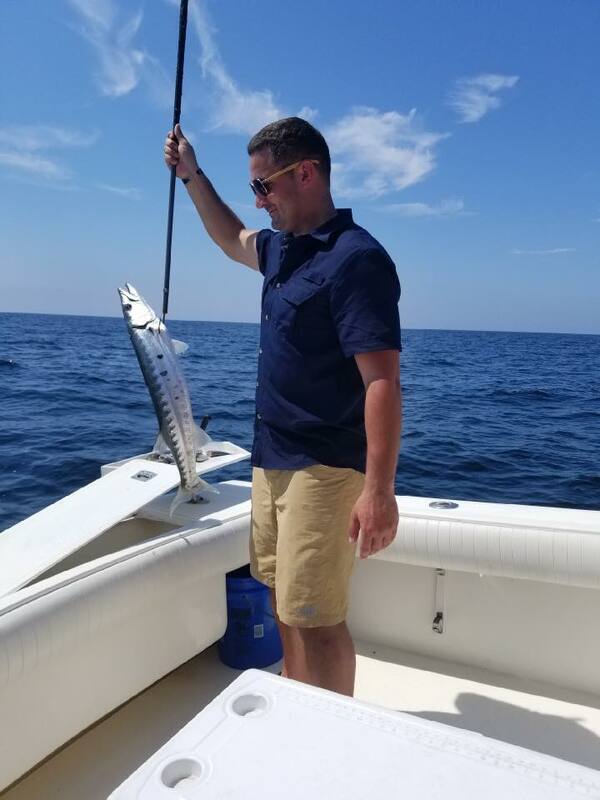 We did some off shore fishing and had a really great time and we picked up the boat. Flat tire and the bearings were pretty shot on the trailer so we had some work to do to change out the hubs and wheels and tires. 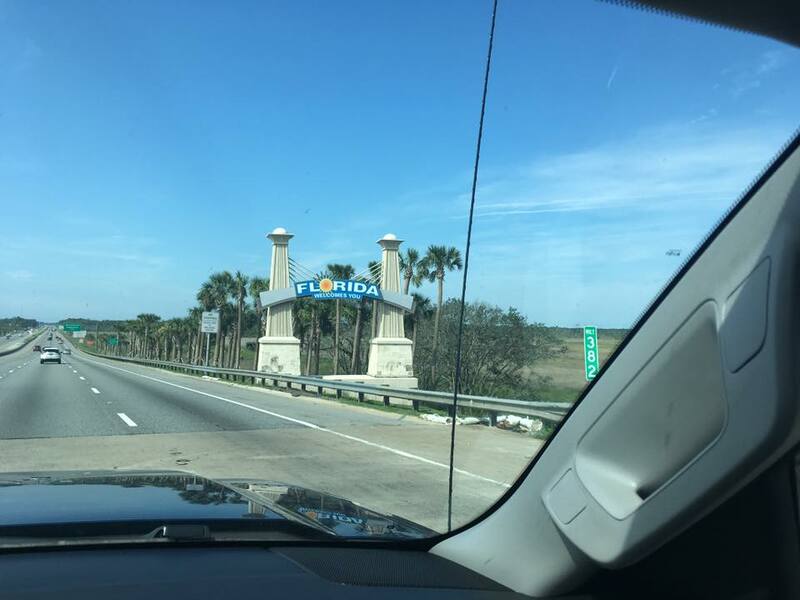 Had a nice long weekend and Florida and got the boat home safe and sound 2000 miles later. Thank you for posting and justifying my habit and also long road trips and trailer rehab stories. I wasnât smart enough to add in a little fishing time. 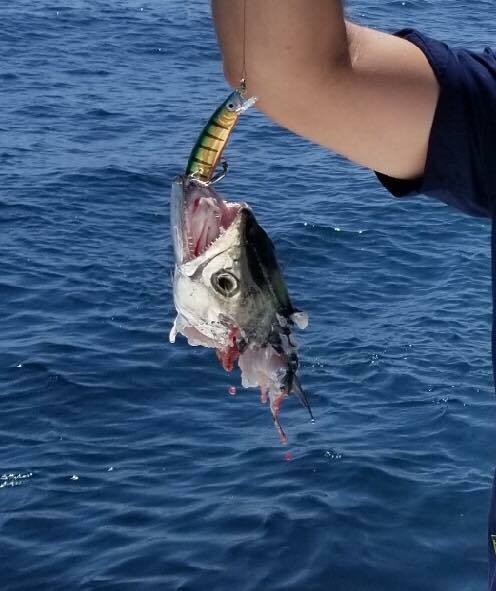 Looks like their are even bigger fish out there... CHOMP! Glad you are home safely! Yeah, I was doing pretty well. 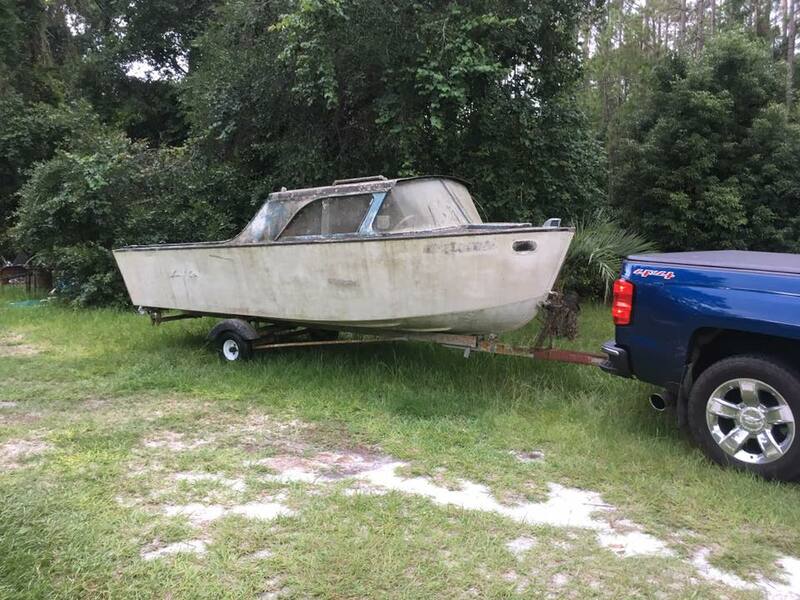 I was old boat buying "sober" for a little over 6 years. Had a nice trip going off the "wagon" lol. The price was right and having just restored the same boat, I feel pretty confident I can do this one faster and easier now. Well, I started on her. Got the cockpit and cabin cleaned up and removed all the junk. Drained all the water and swept out the floor. Someone had added an ugly wood bulkhead to the boat. It was pretty easy to remove. The only benefit to this is that I think it helped preserve the 58 year old original seats pretty well. Yup, you got bit by the bug really hard. Reading thru the posts reminded us of the side trips to pick up a craigslist gas tank, various missing lights and windshields. We'd play hookie and take an even sider trip to a cool place to dine while we were out and about. Our journey added a commercial sewing machine to sew the seat upholstery, was about the price of one seat redo. Lot's of youtube videos on how to's on about every part of the restore. Good luck, we're all rooting for you! Michael, hope you can work the same magic on El Dorado Number 2 that you did on the first one. Inspiring restorations. I am just starting on a 1956 Clipper and don't know what I am doing. This helps.